The table has as many rows as points in the project (GCPs / Manual Tie Points / Check Points). Each row displays information for one point. By clicking the column title of the column used for sorting, the table will be ordered from smaller to higher values. By clicking again the column title, the sorting will switch from smaller to higher to from higher to smaller and vice versa. A triangle indicates which column title is used for sorting and the type of sorting. Click on any of the point´s cells. The row corresponding to the selected point is displayed in blue. For points that are consequent: Press the Shift key and left click on the first and last point to be selected. The rows corresponding to the selected points are displayed in blue. Alternatively, left click on one point and while keeping the left button clicked, move the mouse up or down. For points that are not consequent: Press the Control key and left click on all the points to be selected. The rows corresponding to the selected points are displayed in blue. Select the point to delete by right clicking on the selected point and clicking Remove Selected in the context menu that opens. Select the points to be deleted by right clicking on the selected points and clicking Remove Selected in the context menu that opens. Right click on the table and click Remove All in the context menu that opens. 2. Click the left arrow to select among the existing values. 3. Press Enter or click outside the cell. 1. Right click one cell from the column. 2. Click Edit All (Types / Third coordinate / Horz. Accuracies / Vert. Accuracies). 1. Right click one of the selected cells from the column. 2. Click Edit (Types / Third coordinate / Horz. Accuracies / Vert. Accuracies) in Selected Rows. Black: For points that have been marked on less than 2 images. Green: For points that have been marked on 2 or more images. Red: For Manual Tie Points that have been marked on less than 2 images and for which no 3D position has been estimated. This is the case for Manual Tie Points that are added using the GCP/Manual Tie Point Manager. When importing the label from the GCP file. When pressing the Add Point button. When drawing an object in the rayCloud. When manually editing the label: Double click on the corresponding cell and enter the new label. Note: Labels that are automatically generated by the software start with "mtp" followed by a number that increases with the number of points added (e.g. mtp1, mtp2, mtp3, etc.). 2D GCP: A 2D GCP is a point that has a known 2D position in the scene and is used for the project's AAT/BBA. 3D GCP: A 3D GCP is a point that has a known 3D position in the scene and that is used for the project's AAT/BBA. Check Point: A check point is a point that has a known 3D position in the scene and is used for checking the accuracy of the reconstruction. It is not used for the project's AAT/BBA. Manual Tie Point: A Manual Tie Point is a point that is manually identified in several images. Its position in the scene is not known. Manual Tie Points are also created by drawing an object on the 3D View of the rayCloud. Each vertex of the object corresponds to one Manual Tie Point. When GCPs are imported from a file, the GCPs type is automatically set to 2D GCP or 3D GCP depending on how many coordinates the points have in the imported file. When a new point is added by clicking Add Point, then the type is by default Manual Tie Point. The point type can be defined manually: Double click on the corresponding cell and choose the desired type from the drop-down list that appears. When a new Manual Tie Point is added with the Add Point button, the last four columns of the table are grayed out and nothing is displayed. When the point is marked on at least two images, and if step 1. Initial Processing has already been done, the coordinate columns are filled with the coordinates computed. The coordinates cannot be edited and the Accuracy Horz and Accuracy Vert columns are grayed out. When a Manual Tie Point comes from creating objects in the rayCloud, then the three coordinates are filled with the coordinates computed. The coordinates cannot be edited and the Accuracy Horz and Accuracy Vert columns are disabled. When importing the coordinates from the GCP file. When manually editing the table: Double click on the corresponding cell and type the coordinate. Note: For GCPs added using the Add Point button, the proper Type has to be changed in order to enable the coordinate columns. Note: For GCPs added using the Add Point button, the proper Type of the GCPs has to be changed in order to enable the coordinate columns. All GCPs and Check Points have to be given in the same coordinate system. The GCP horizontal accuracy defines the horizontal accuracy value (Accuracy Horz). The horizontal accuracy refers to the first and second coordinates (latitude, longitude, or X,Y). Very accurate GCP (latitude, longitude, or X,Y) coordinates: Low accuracy value. 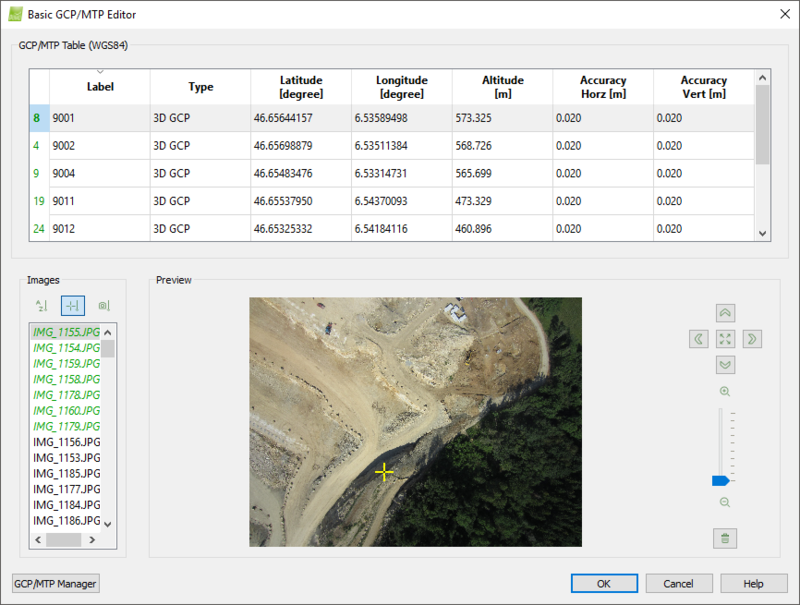 Non accurate GCP (latitude, longitude, or X,Y) coordinates: High accuracy value. The higher the accuracy, the less influence the GCP will have compared to other GCPs with lower tolerance value in step 1. Initial Processing. The accuracy is a value between 0.001 and 10'000 meters. Note: The horizontal accuracy is editable for 2D and 3D GCPs. To edit the horizontal accuracy of one GCP, double click on the corresponding cell and enter the new value. 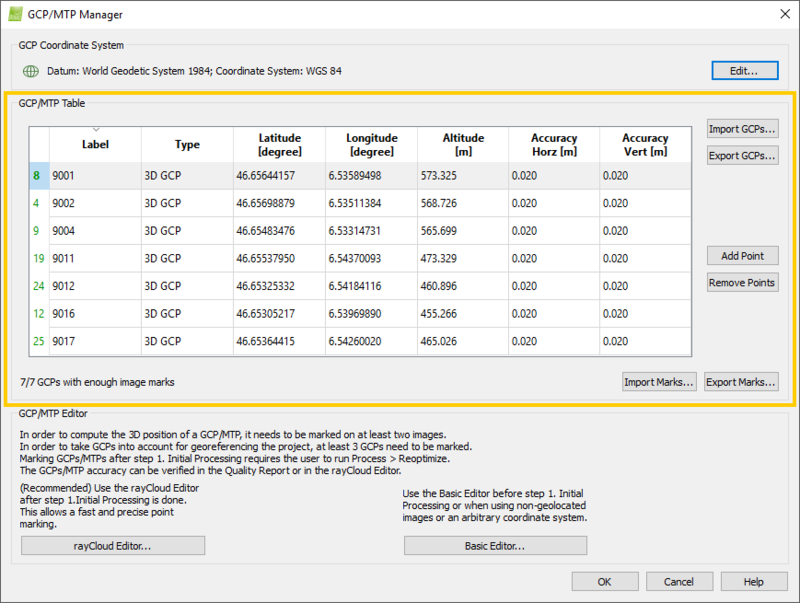 For more information about editing the horizontal accuracy for multiple GCPs: 202557919. The GCP vertical accuracy defines the vertical accuracy value (Accuracy Vert). The vertical accuracy refers to the third coordinate (altitude / Z). Very accurate GCP altitude coordinate: Low accuracy value. Non accurate GCP altitude coordinate: High accuracy value. The higher the accuracy, the less influence the GCP will have compared to other GCPs with lower accuracy value in step 1.Initial Processing. The accuracy is a value between 0.001 and 10'000 meters. Note: The vertical accuracy is editable only for 3D GCPs. To edit the vertical accuracy of one GCP, double click on the corresponding cell and enter the new value. For more information about editing the vertical accuracy for multiple GCPs: 202557919.